Forget pizza shop pizza, try these homemade, perfectly-portioned personal pizza’s for your next family pizza night. American’s love pizza. Not gluten-free or cauliflower crust varieties; not vegan or the kind made on zucchini. I’m referring to the traditional high-fat, high-sodium popular pie you find at the local pizza shop. I’m not suggesting you head to your local pizza shop to celebrate, though. Instead, I’m encouraging you to think outside the pizza box. Let me explain the challenge with fitting most pizza-shop pizza, into a balanced meal plan. Take a second to visualize a traditional slice of white bread. Now, visualize one slice of your favorite pizza shop pizza. Consider the bottom dough of the slice, as well as the crust. How many slices of white bread do you think it takes to make one slice of pizza? Two? Three? Maybe four? The answer will depend on a few things- did you visualize thin crust or thick? Was it cut from a small pie or large? Was it sliced as a square or a triangle? I compared the nutrition facts of three popular pizza chains. Turns out, they are all very similar. One large, 14” slice of hand-tossed, cheese pizza is ~38 g carbohydrates, 10 g fat and 11 g protein. That means that one slice of pizza is comparable to eating 2 ½ slices of white bread. Actually, one slice isn’t bad. If you pair that slice with a lean protein and some vegetables, you have a balanced meal. The problem is, that’s not the way most people eat their pizza. The challenge comes when dinner is solely from the pizza box. Before you know it, that one slice of pizza that’s comparable to eating 2 ½ slices of bread, turns into two slices, comparable to 5 slices of bread, or three slices of pizza that’s comparable to 7 ½ slices of bread. Would you eat 7 ½ slices of white bread, 3 ounces of shredded mozzarella cheese, ½ cup pizza sauce and a tsp of oil for dinner? If you eat 3 slices of pizza from a pizza shop, that’s basically what you are eating. Not to worry. Over my years of counseling, I’ve learned not to mess with people’s pizza. This all-time favorite can fit into a healthy diet with some adjustments. If you can’t go without your favorite pizza shop variety, eat fewer slices and pair it with a protein and a vegetable. If you find it impossible to stop at a slice when you have the entire pizza pie sitting in front of you, take the temptation away by making your own. You can use store-bought mini bagels, English muffins, flatbreads or thin tortillas to make a homemade variety, or, buy a pizza crust mix and make personal sized pizzas. The best part about dividing the crust is that you can create a perfectly portioned pizza’s and everyone gets to choose their own favorite toppings. It’s a lot less expensive, too. Try the recipe below to make perfectly-portioned pizza for your next family pizza night. 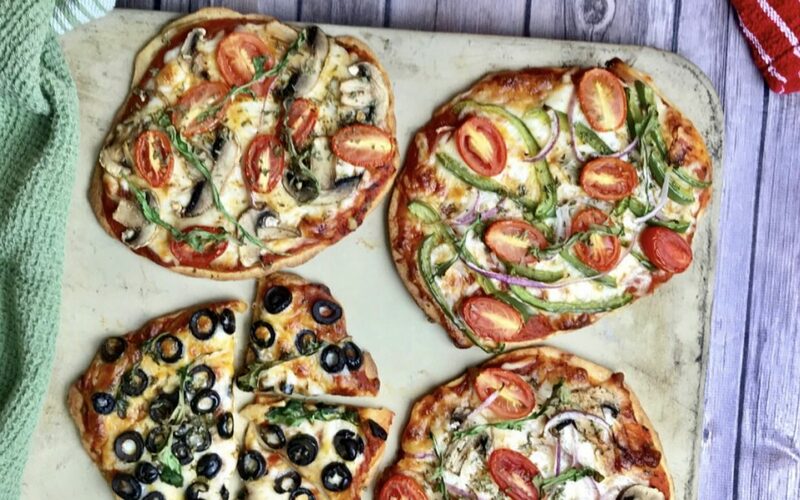 Forget pizza shop pizza, try these homemade, perfectly-portioned personal pizza's the next time your family calls for a pizza night. – Combine pizza crust mix with hot water in a medium bowl; stir with a fork until well blended. Pour the 1 tsp of oil into the palm of your hand and shape the dough into a ball. (Using the oil directly on your hands prevents the dough from sticking.) Cover; let stand 5-10 minutes. – While dough is rising, slice the tomatoes length wise in half; slice the mushrooms, green peppers, and red onion. Rain the olives and set ¼ cup aside. – Once dough has sat 5-10 minutes, remove it from the bowl. Place it on the pizza pan that has been sprayed with cooking spray. Using a pizza cutter, cut the dough into 4 even pieces. Each piece will be used to make a personal pizza. – Using hands press each ball of dough flat in a circle. Generously prick dough with fork. You should have four round pizza crusts that are similar in shape and size. – Put the crust in the oven and bake 3 minutes. (Watch crust carefully; smaller portions require shorter cooking time than making one large crust pizza. – Remove from oven. Top each pizza with 3 Tbsp. sauce, 1/3 cup mozzarella cheese and desired vegetables. – Bake an additional 8 minutes or until crust is golden brown and toppings are thoroughly heated. – The nutrition facts listed for each pizza reflects an even combination of the toppings included in the ingredients. – Slice each pizza as desired and serve. Pairing Recommendation: serve with a dark-green leafy vegetable side salad using the vegetables that didn’t end up on your pizza. If you like this idea, have something to add or try the recipe, let us know what you think. Leave a comment below or take a picture, tag @heathermangieri and hashtag is #HeatherMangieriNutrition. Perfect for a quick meal.